The Book of Me Scrapbook Layouts challenge for this month will focus our Scrapbook Layouts on our parents, culture, heritage. 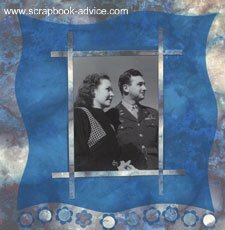 Since May is National Scrapbooking Month, and since scrapbooking started with Heritage books, this is a good time to honor or celebrate our heritage by creating pages that celebrate your ancestry and the special older people in your life. Option #1 - YOUR PARENTS - Do a Book of Me Scrapbook Layout focusing on your parents. How did they meet? Tell about their courtship and marriage. Or describe their personalities and/or physical traits. Which one do you most look like? Act like? What types of work did/do they do? How did their careers affect your upbringing? How has your relationship with them changed over the years? Layout idea: Use a Family tree design with photos of your parents, and siblings. How about the tree as the family structure with the names of your family members significantly arranged on the tree leaves. While I was planning some sort of family tree thing here, I was able to find these 2 large photos of my parents, both before and after they were married and the "tree" idea went out the window. The multi-blue background papers went well with the black and white photos. The blue is a vellum 12 x 12 sheet, cut out and I used the frame for one side and the center portion for the other side layout. The floral punched itemsat the top and bottom of the pages and the 1/4 inch paper ribbons were cut from left over scraps of the papers from behind the photos. Even though the focus here is Book of Me Scrapbook Layouts, it does show where I came from and who I look like. Option #2 - YOUR ANCESTRY - There are so many avenues for this topic. You can focus on your cultural heritage or a famous ancestor. You can tell how your family settled in your hometown. You can feature your family tree. Do you have family reunions? How many generations attend? Perhaps you have a portrait of several generations that can be featured in a layout. Photo ideas: Take a few of those generational photos the first chance you get, even if you are not ready to do this challenge now. Option #3 - FAMILY TREASURES - Is there a particular family story that is special to you? Do you have a tradition that is unique to your family? How did it start? Do you possess a treasured family heirloom? What is the story behind it? Do you have a favorite older relative who is a treasure to you? 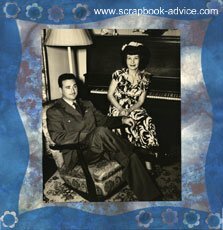 Create a layout focusing on a family treasure that/who is very special to you. 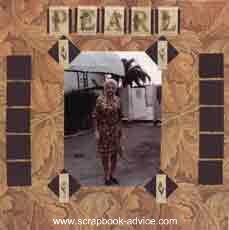 Photo and Scrapbook Layout ideas: Photos of the family heirlooms and the original owner - if not together, then separately. How about a sales receipt for the item or newspaper or magazine ad about it. 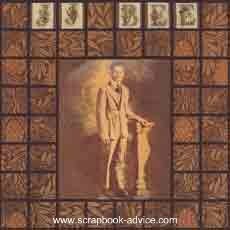 You can really take this idea of heritage through a number of layouts of even into an entire heritage scrapbook. Option #4 - ANCESTRY RESEARCH - With the new interest lately of doing family history research brought on by TV programs like "Who do you think you are?" and new scientific options about DNA available, take this challenge to go back further in your research than just the family photos you may have on hand. Think about getting the family together, whether it's by setting up meetings or conference phone calls to work on this type of project together. You can always scan documents that you find in your research and use those to include in your Book of Me Scrapbook. 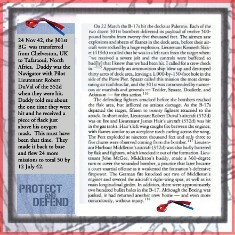 Below is a scrapbook page I have done from a WWII document I found from 24 Nov 1942. It's an Air Crew Report (ACR) from a flight when my fathers aircraft caught fire. The document is on the right and my comments about the document and a story my father told me are in the box on the left. I used some Military paper from Club Scrap and some digital ribbons are also included. It's a great scrapbook page without any photos.